Type defines set of values. Variable of given type can hold one of the values from this set. Types are organized into basic classes, type object is parametrization of a type class. For example Int 9..11 is parametrization of type class Int. Such type can contain only value 9, 10 or 11. Value represents a value in the system. It is defined as union of pointer/integer. Minimal size of the value is 32 bits. On 64bit systems, it will be 64 bits. Value does not encode type (we always have to work with value/type tuple. Type interface is implemented by type provider. 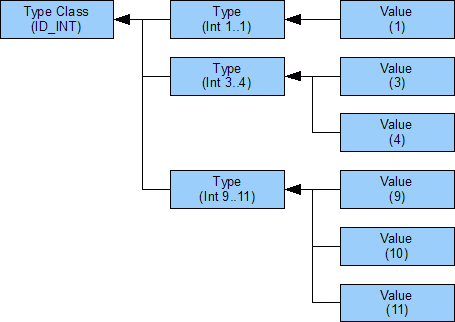 By implementing the type interface, you can provide new class of values. Free all resources associated with specified type. Return true, if specified value may be contained in variable of specified type. Value is guaranteed to be of same class. Return true, if all values storable in subtype can be stored in specified type too. Free value of specified type. Create copy of the value of this type. Write the value as text.